After being on the sidelines for years watching my two sons gliding across the water in beautiful, swift rowing sculls, I finally decided to try it myself. Our local beginning adult crew team practices in the evenings, and it is a fun, social experience. Now I realize that’s an ingenious ploy to get newbies hooked, and eased into the sport. 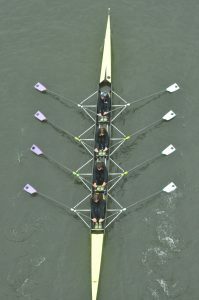 I loved it and quickly got obsessed with improving my technique, getting fitter, and rowing faster. Fast forward three years. After much reshuffling of family responsibilities, I recently joined a competitive team that rows from 5:15 to 7 am on Mondays, Wednesdays, Fridays and Sunday mornings. Rain or shine, we either row on the water or exercise in the weight room and on the indoor rowing machines (called ergos). The four-times-per-week commitment is not easy to keep, especially with my busy travel schedule. Many team sports involve studying playbooks, cultivating players to be good at certain positions, and learning how to take advantage of your opponents’ vulnerabilities. Rowing utilizes few of these practices. Especially during a race, there is very little interaction with other crews. Rowing focuses on uniformity and building a fantastically hard-working, courageous, enduring, dedicated, selfless, team of people who are completely synchronized and focused on the same goal. 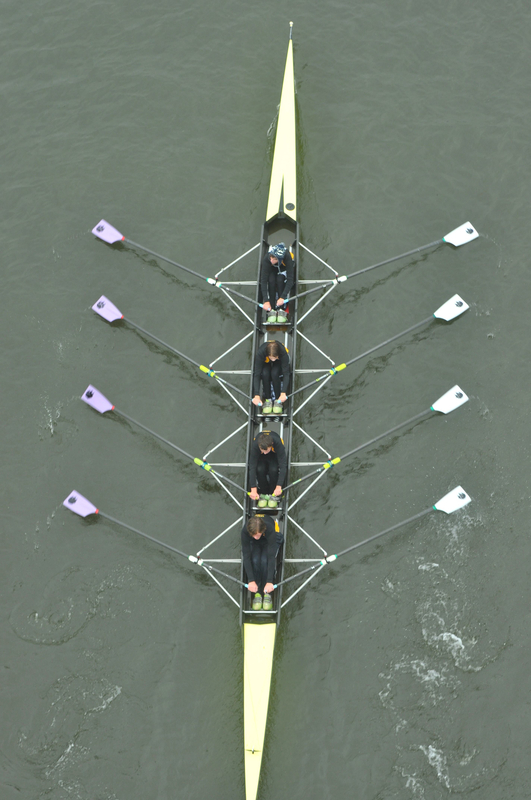 “[Keep your] head in the the boat!” is one of the common instructions that rowers hear from the person steering the boat, known as the coxwain. Does that sound anything like the focus needed from a successful startup team? It takes many months of practice for an eight-person crew to achieve the same power, rhythm, and consistency. The boat can only travel as fast as the slowest rower. Training doesn’t only progress in a linear, forward manner. Often it takes overcoming individual as well as collective shortcomings before the boat really starts moving efficiently and quickly through the water. After weeks and weeks of training, when synchronicity finally happens, an astonishing wave of power takes over the boat. What had previously been strained and difficult all of a sudden becomes easy and poetic. There is no one powerful hotshot upon whose shoulders success or failure is placed. It takes a team to do anything of lasting value. In a rowing shell, if one person fails, everyone fails. “Catching a crab” is a terribly humbling experience that usually stops the boat dead in the water. It sometimes even catapults a rower right out of the boat. Even very experienced rowers sometimes make this mistake. To help avoid trouble, everyone on the team must pull not only for themselves, but for each other. Getting to the finish line with all the rowers in the boat is the only way to win a race. If you’re in the market for a new adventure, give rowing a try! Your local rowing club most likely offers “learn to row” sessions to get you started. You should be able to participate on a recreational team, either forever or until [like me] you get hooked and decide to join a competitive team. If you’re in Pittsburgh and want to come check it out, contact us at Three Rivers Rowing. We’re super-friendly! If it’s not possible for you, consider hiring a former or current rower. Especially if your team is having trouble functioning as a cohesive unit.